NEPTUNE – The transition from rebuilding after Superstorm Sandy to spreading hope further and wider in Greater New Jersey was a main focus of A Future With Hope’s Board of Trustees at their February meeting. By developing Hope Centers in partnership with congregations and other likeminded nonprofit organizations, an evolving vision of hope is unfolding. The Hope Center team presented their progress in partnering with six nonprofit organizations to join the Hope Center movement including CAMP Y.D.P., Christian Outreach Project, CUMAC, Pathways to Prosperity (Noresescap), the Neighborhood Center and Camden Urban Ministry Initiative. “Hope Centers are places of community transformation that offer youth development, education, food security, job development and social support within communities,” said Hope Center Developer Andrea Wren-Hardin. She added that the team expects to establish three additional Hope Centers with GNJ congregations this spring. While the transition to Hope Centers is progressing, the Board also spent time reviewing the final push of Sandy recovery and rebuilding. A Future With Hope Director Bobbie Ridgely, who has led the Sandy recovery efforts shared that through the end of 2017, A Future With Hope has rebuilt 254 homes with the help of 11,741 volunteers. She said there are nine homes currently under construction with work completion scheduled for June 2018. The February 8 meeting marked Ridgely’s last as Director and concluded with the Board joining GNJ staff in a celebration of her work to lead United Methodists in Greater New Jersey in the recovery effort. Representing the Board of Trustees, Dr. Patricia Morton, Director of The Spinal Cord Injury Project at W. M. Keck Center for Collaborative Neuroscience at Rutgers University, led the accolades for Ridgely’s work. “Three things have undergirded all that Bobbie did: initiative, innovation, and integrity,” said Morton. 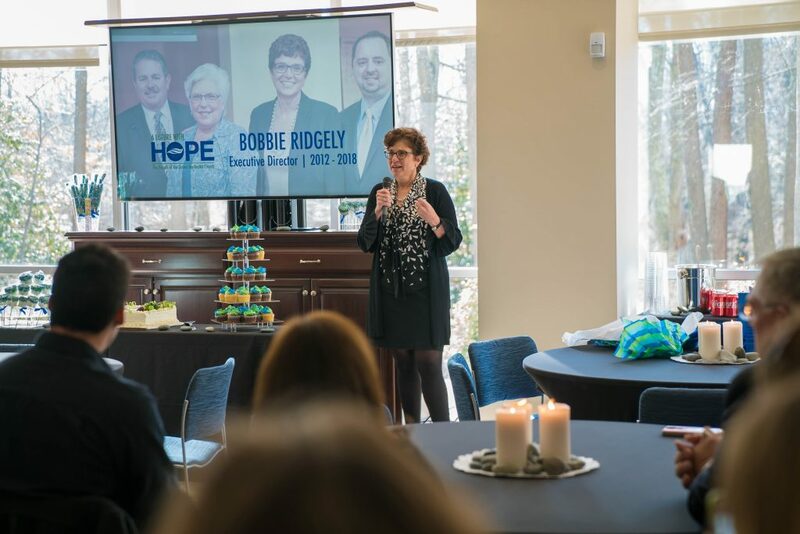 A Future With Hope has partnered with over two dozen long term recovery groups, funders and faith-based nonprofits thanks to Ridgely’s focus on making connections and building alliances. These alliances have been largely responsible for raising $17.5 million for A Future With Hope with funding from the American Red Cross, the Robin Hood Foundation, the Hurricane Sandy New Jersey Relief Fund, UMCOR and others. It has also led to new relationships with ecumenical partners including the Episcopal Relief and Development, the Salvation Army, Lutheran Social Ministries, World Renew, Christian Public Service and others. Ridgely, a member of the UMC in Red Bank, also credits the power of the United Methodist connection for the work that has been accomplished. More than 400 GNJ churches joined the work of A Future With Hope by volunteering, serving as host sites, hosting dinners, providing welcome home gifts and donating to the Mission Fund.